Oakland Township does not have any Senior Assisted living facilities. Our population is aging. As the “Baby Boomers” reach retirement and incur some of the age related health issues, housing decisions become difficult. Many seniors who have lived in Oakland Township for many years have been forced to move out of our Community. This facility provides an alternative that will allow them to continue to be contributing members of our Community and be near friends and family. 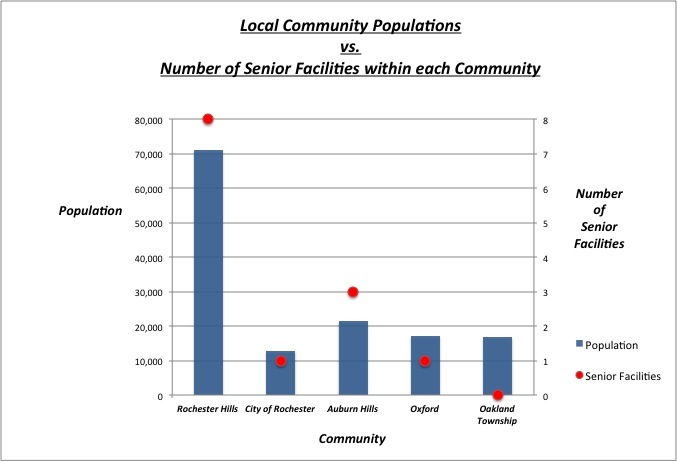 The following chart shows the number of residents in several of our surrounding communities as well as the number of Senior facilities in each community. All of our neighbors have a number of facilities that is relatively proportional to their population. Oakland Township is the only community that does not have ANY senior facilities for its citizens. “We are NOT against senior developments.”. Now that those same residents know that the Federal Government is investigating Oakland Township for possible Fair Housing violations, they are attacking the development for density, size, height and traffic reasons. Please read the responses to those concerns on another page under Blossom Ridge. 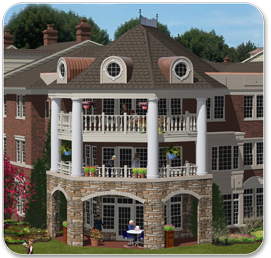 Blossom Ridge will be a major enhancement to the quality of life for many of its citizens! Do you agree that there will be a growing need for Senior Housing in the coming years? When you need assisted living do you want to move away from where you are living now? Do you want our Seniors to rely on other communities to satisfy their needs? Density, height and traffic have always been at the core reasons for the opposition. HUD investigation came after the referendum passed. Nice try confusing the issue but lies have short legs. You have very slanted story telling skills instead of fact based reporting. If you look at the minutes of the various Planning Commission and Township Board meetings during the initial approval process, you will clearly see comments made by citizens that were opposed to any assisted living facility. One specific example is where on March 27, 2012 citizen Jeanne Langlois (now Township Treasurer) stated she believes people are “content to look outside the Township for this type of housing”. Unfortunately, that statement as well as others documented in the minutes of the meetings will probably be used against us as the HUD/DOJ investigation proceeds. The developer has made numerous compromises from their original plan to address the density, height and traffic issues raised by citizens. The most recent compromises made within the past 2 months include a further reduction by 10 units and eliminating the third floor. The previous traffic study, that was confirmed by the County Zoning Committee, concluded that the traffic during peak hours would be less than if the parcel was developed as a single family residential development. By the way, the HUD investigation was started long before the August 2013 referendum passing.